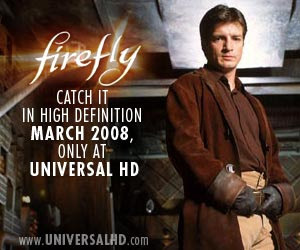 For those of you lucky enough to have Universal HD, they're going to be showing Firefly in March! Browncoats all over the net are taking the opportunity to show NBC/Universal how popular the show is and try to convince them once more to give us more Firefly/Serenity!!! What is Operation Full Burn? : Operation Full Burn is an operation designed to support the 'Verse and a Sequel to the BDM. How does it work? : Simple, between now and the start of the re-airing of the BDS on the Universal HD channel we get as many Browncoats as have ears to sign up to these Universal HD Firefly Fan Forums as we can. It don't cost nobody a nickle yet it lets Universal (makers of Serenity) know that we are still here and we still want more of the 'Verse. It's as easy as lyin'. Why? How will this help? : As of right now there are 1,738 folks signed up to these here forums and of them I'm going to low ball and say only 1,500 are Browncoats. None the less it's a micro fraction of the total number of Browncoats out there. Basically, the number of unique users on a website or on a particular forum is a form of ratings all it's own. We all know that it's all about ratings and numbers right? So with the Universal HD channel scheduling the BDS again starting in March it would be wise notion and a real display of our love and dedication for the show, the movie, the 'Verse in general, as well as the sequel that ought be made, if those website ratings jumped up more than a bit before the show starts to re-air. We get enough Browncoats here it would say a powerful lot about us and what we want. How you can help: JOIN THE UNIVERSAL HD FIREFLY FAN FORUMS! Once you've joined help spread the Signal! I can't go every place in the 'Verse, I just don't know where they are. Most folks are members of 2 or more boards so please feel free to re-post this in some of your other boards. Dig it if your a Digger. Blog it if you're a blogger. I don't have a Myspace account so it could go up there. Facebook too. Where ever you can think of really. The OB's. Sci-Fi boards. Doesn't matter, it's all good so long as we let every Browncoat on every world spinnin' know about it. Below I've made a few banners. Feel free to use them if you like or make your own if you're more artistic than me (I won't be offended in the least). Jayne said it best I think - "If wishes were horses we'd all be eatin' steak." I'm not one to just "wish" something to happen. I want to at least "DO" a little something. Maybe it's because I missed it all before. I missed the BDS when it was on TV and I missed "Doing the Impossible" and that feeling of being part of getting the BDM made because I'm a newer Browncoat. So I guess I feel like I have to at least TRY to help get it done again. Kind of my own little labor of love perhaps. As of when I joined membership had climbed to 1,893, so over 150 people have joined the forums since when this message was posted on Friday.